During a visit to his home country of South Africa in the 1960s, Gary Player led Arnold Palmer deep into the heart of a gold mine, some 8,000 feet into the earth, and when they emerged several hours later, Player had himself one more legendary tale to tell about his remarkable friend. As Player recalls, he showed Palmer into a room where he said there might have been a billion dollars in gold bars stored. Workers poured the melted gold into bars right there on the spot for transport to the surface, and the foreman in the room told the duo and several other visitors that if any one of them could pick up the gold bar in front of him, he could keep it. The trick was that it had to be with just one hand. And Palmer, with his “blacksmith arms” and huge hands, simply stepped forward and plucked the bar up with one of his enormous mitts. Many things Arnold Palmer did during his life and career in golf were amazing, and, of course, it all started with his hands. If you ever shook hands with The King, you saw for yourself because your hand would be swallowed in his. But just as significant is their symbolism. They were the hands that helped spur popularity in golf, that almost single-handedly built the PGA TOUR, that signed millions of autographs and welcomed people from all walks of life into his world. “Anyone who met my dad knows there is something about his hands that is unforgettable,” says his daughter, Amy Saunders. “Aside from simply who he is, what is the most identifiable thing about Arnold Palmer? And everyone knows it’s his hands,” echoes Cori Britt, vice president of Arnold Palmer Enterprises. Together Saunders and Britt recognized what needed to be done when a new trophy was to be created for the Arnold Palmer Cup, the annual collegiate team event contested between college players from the United States against those from Europe. 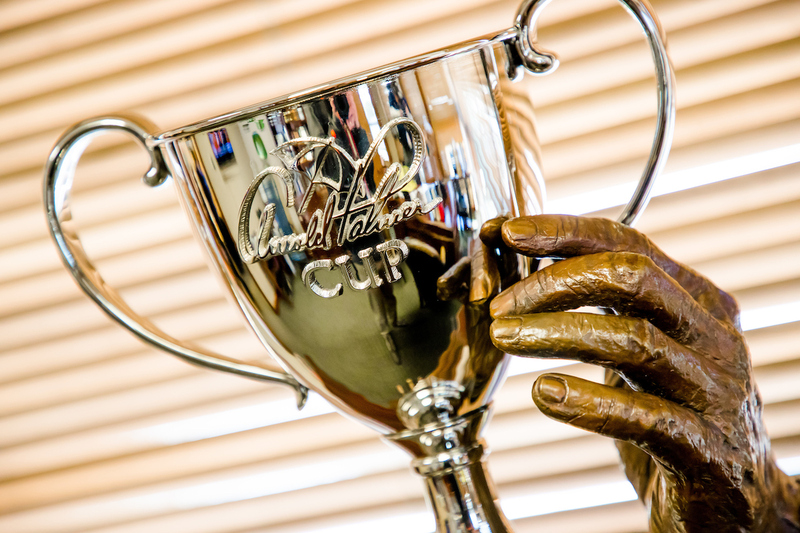 Begun in 1997, the event originally was known as simply the Palmer Cup, but the name was changed in 2015 to the Arnold Palmer Cup for the 2016 edition. Beginning in 2018, the prestigious match play contest will feature players from around the globe against a U.S. team, and it will include men and women competing together. The winning team this year, on the 20th anniversary of the event, will have their name inscribed in the base that features the bronzed hands of the late legend cradling the removable cup - one giant hand underneath and the other on one of the handles. The idea for this iconic trophy took time to percolate. As it turns out, a stirring reminder happens to be hanging in Saunders’ home in Orlando. “There is a photo of my dad holding our grandson [Samuel Schneider– Palmer’s great-grandson] and I took the picture because I was so amazed by what I was seeing,” she explains. “I focused in on his enormous hand holding this tiny baby, and his hand is as big as the child. Getting the trophy just right took time and the creative energy of a team including artist Karen Powell and sculptors Mike Cunningham and Becky Ault of Art Research Enterprises in Lancaster, Pa. The Palmer family already had a relationship with Art Research. Their foundry created the 15-foot bronze abstract sculpture and memorial dedicated to Winnie Palmer at the Winnie Palmer Nature Reserve at St. Vincent College in Latrobe, Pa. The process of creating the trophy took six months. “We wanted to make certain we got every detail exactly right,” Cunningham says. That started with Ault’s initial drawing concepts led to a session in the fall of 2015 with Arnold dipping his hands into alginate so that exact molds that capture all his features could be produced. That portion of the project got off to an inauspicious start. As he was preparing the mixture, Cunningham realized, “that we were going to need bigger buckets than we thought.” Later, Cunningham added the sleeves of the cardigan sweater that Palmer famously wore almost daily, which further accentuated the sculpture. Supported by the Arnie’s Army Charitable Foundation, the Arnold Palmer Cup provides a platform for perpetuating Arnold Palmer’s commitment to youth development and the growth of amateur golf, particularly at the collegiate level. Golf is usually an individual sport, but the Arnold Palmer Cup sets a different stage where young men and women work together as a team toward a common goal. Palmer hit it hard on the course, as do many of these young players, but Arnold also famously said "Success depends less on strength of body than upon strength of mind and character.” The Arnold Palmer Cup brings this notion to the forefront as young players are reminded of his stellar example of a life well played. Palmer not only was a big believer in the event that bears his name, but also in international team competition overall. He was a six-time competitor in the Ryder Cup, and posted a record of 22-8-2. He made his debut in 1961 at Royal Lytham and St. Annes, England, and he won 3½ points for America. He recalled getting choked up when the Star-Spangled Banner was played. Two years later he served as playing captain at Atlanta Athletic Club, a 23-9 victory for the U.S., and in 1975 he was the winning captain again at Laurel Valley Golf Club in Ligonier, Pa. In 1996, Palmer enjoyed another win at the helm of an American team, this time in the second Presidents Cup. And six times he teamed with a fellow American to win the World Cup of Golf, twice with Sam Snead and four times with Jack Nicklaus. The Arnold Palmer Cup has a more personal touch now with the new trophy. And what it represents reaches beyond the event itself. There was one final touch added to the sculpture in the final phase of its creation. It’s the addition of the Rolex watch on the left wrist. It was not part of the original. The time on the watch is set to 9:29. The date shows the 10th. It, of course, represents Arnold Palmer’s birthdate of September 10, 1929.